Dainty Dollymix UK Beauty Blog: Shopping: In store or Online? Shopping is one of my favourite past times. These days, I do it less frequently than I used to do when I was slightly younger or when I was a student. Priorities over the years have changed and I spend less time spending my hard earned pennies on designer handbags and expensive jewellery like I once did. These days, I opt for using the internet for online shopping rather than visiting stores. Usually 9 times out of 10 these days I purchase things online over buying in store. I think its the ease of browsing online 24 hours a day. Discount codes are another thing that sway me more about buying online. Long gone are the days that I was a student and could crack my student card out on the high-street for 10% discount, these days I need to scour voucher code websites for online discounts for my favourite stores with new look and asos frequently having money off codes. Click and collect is another reason I shop online. Id much rather order from the comfort of my own home knowing full well that I can collect in store at a time that is convenient for me, and for free. I do know that some people love going into stores, trying clothes on and having a good feel of them before I buy but I would happily order in bulk, usually with discount and free delivery, try them on at home and return them or post them back if need be. The internet has definitely changed the way I shop, especially online. 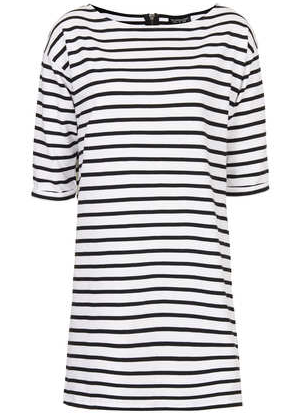 I have even just purchased a gorgeous stripey top from Topshop with 10% discount and free delivery, something I wouldn't have got in store so it paid to purchase online. How do you prefer to shop? Online or in store? I love the simplicity of this outfit. What a beautiful dress .Thanks for sharing a beautiful and high quality brand .everything looks so comfy!